A Cook memorial in Cambridge, England (and Episode 16 redux). Episode: 50. Site Numbers: 042, 087. Date Posted: 1 October 1997. 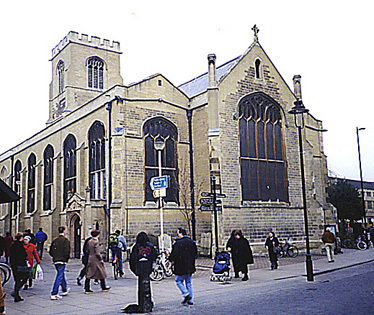 Location: St Andrew the Great, St Andrews Street, Cambridge, England. Type: Memorial/Plaque. Two years ago at about this time I had the pleasure of visiting for a couple of days Cambridge and the Scott Polar Research Institute. While there, I enlisted the assistance of that great Man of Antarctica, Charles Swithinbank, to seek out two 'Low-Latitude' sites of which I had heard vague rumors. As it turned out, Charles was almost as much in the dark as I was. However, he took it on as a worthy lunchtime adventure and in due course we found both. The first--earlier noted in Episode 16--is Edward Wilson's powder blue college flag (042) that now inhabits a curtained case beside the high table at Gonville & Caius College. It's probably the one mentioned in his Terra Nova journal, on page 83, a note to which identifies the flag as bearing the arms of Caius College and presented to Wilson by the wife of the Master and later carried to the Pole. In memory of Captain James Cook, of the Royal Navy, one of the most celebrated Navigators, that this, or former Ages can boast of; who was killed by the Natives of Owybee, in the Pacific Ocean, on the 14th day of February, 1779; in the 51st Year of his Age. Of Mr. Nathaniel Cook, who was lost with the Thunderer Man of War, Captain Boyle Walsingham, in a most dreadful Hurricane, in October, 1780; aged 16 years. Of Mr. Hugh Cook, of Christ's College, Cambridge, who died on the 21st of December, 1793; aged 17 years. 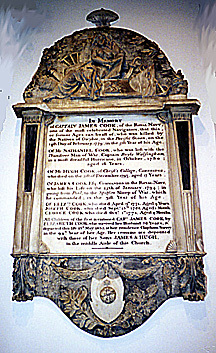 Of James Cook, Esq; Commander in the Royal Navy, who lost his Life on the 25th of January, 1794; in going from Pool, to the Spitfire Sloop of War, which he commanded; in the 31st Year of his Age. Of Elizth Cook, who died April 9th, 1771, Aged 4 years. Joseph Cook, who died Septr 13th 1768, Aged 1 month. George Cook, who died Octr 1st, 1772, Aged 4 months. All Children of the first mentioned Capt. James Cook by Elizabeth Cook, who survived her Husband 56 Years, & departed this life 13th May 1835, at her residence Clapham Surrey in the 94th Year of her Age. Her remains are deposited with those of her Sons James & Hugh, in the middle Aisle of this Church. According to the brochure, St Andrew the Great, Cambridge: A History, Cook's wife "...left £1000, the dividend of which was to be used to maintain her monument."